Courts blocked the GOP from intimidating minority voters. Now Trump is trying again. In 1981, during a New Jersey gubernatorial election, the Republican National Committee launched a “Ballot Security Task Force” that sent sample ballots to voters in predominantly African-American and Hispanic precincts. When 45,000 letters were returned as undeliverable, the RNC tried to remove the voters from the rolls and hired off-duty cops to patrol polling sites in black and Hispanic neighborhoods of Newark and Trenton. Police carried firearms at polling places and wore armbands reading “National Ballot Security Task Force,” while the RNC posted large signs saying, this area is being patrolled by the national ballot security task force. it is a crime to falsify a ballot or to violate election laws. I predicted Trump would resort to these tactics, writing in The Nation in May: “Voter Suppression Is the Only Way Trump Can Win.” His terrible numbers among nonwhite voters have only dropped further since then—he’s winning zero percent of black votes in crucial swing states like Ohio and Pennsylvania—and now that Trump is sinking in the polls, his talk of “rigged” elections is growing more desperate. Trump’s support in the primary directly correlated with racial resentment toward African Americans, Hispanics, and Muslims, which is why it’s not a stretch to imagine Trump’s election observers’ racially profiling and intimidating minority voters at the polls. His widely debunked claim that “people may vote 10 times” is his campaign’s latest racist dog whistle, on par with calling Mexicans “rapists,” proposing banning Muslim immigration to the United States, or vowing to deport 11 million undocumented immigrants. Challenger laws were historically enacted and used to suppress newly enfranchised groups, like African Americans and women. 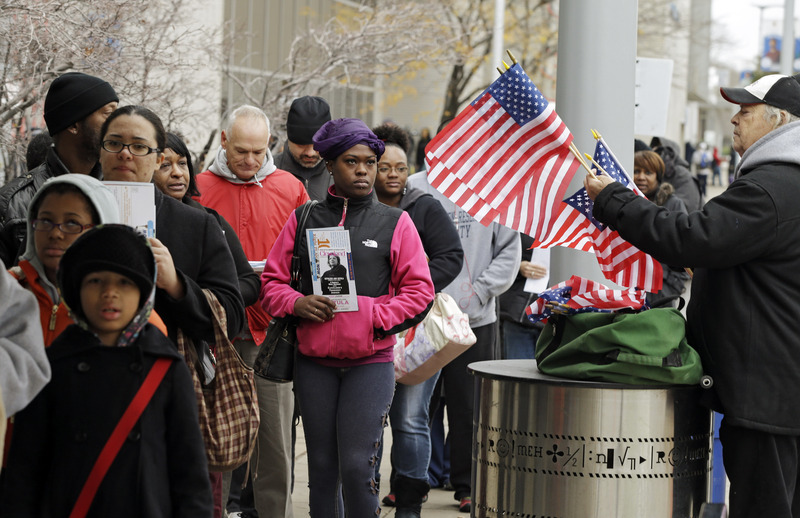 Many states originally enacted challenger laws to block minority voters’ access to the polls. Virginia, for instance, passed its first challenger law in the immediate wake of Reconstruction alongside a host of other suppressive measures, such as poll taxes and literacy tests, aimed at recently freed former slaves. Other states—like Florida, Ohio, and Minnesota—similarly passed challenger legislation during the nineteenth century to suppress turnout in black communities. Even in states where challenger laws were not enacted with an obvious discriminatory purpose, political operatives still often used challenges to discriminate against newly enfranchised groups of voters. For example, during a special election in Lisle, NY, in 1918—the first election after women won the right to vote in the state—every woman who attempted to cast a ballot was challenged at the polls. In 1990, the DNC brought a lawsuit alleging that the RNC violated the Consent Decree by participating in a North Carolina Republican Party (“NCRP”) program. The DNC alleged that the RNC had violated the Decree in North Carolina by engaging in a program of the North Carolina Republican Party (“NCRP”) in which 150,000 postcards were sent to residents of predominantly African-American precincts. This program allegedly attempted to intimidate voters by warning that it is a “federal crime…to knowingly give false information about your name, residence or period of residence to an election official.” The postcards falsely stated that there was a 30-day minimum residency requirement prior to the election during which voters must have lived in the precinct in which they cast their ballot. In 2004, the week before the general election for president, Ebony Malone, an African-American resident of Ohio, brought an enforcement action against the RNC, alleging that the RNC had violated the consent decree by participating in the compilation of a predominantly minority voter challenge list of 35,000 individuals from Ohio. Malone’s name was on the list. To compile the list, the RNC had sent a letter to registered voters in high minority concentration areas of Cleveland and the Ohio Republican Party sent a second mailing approximately a month later. Registered voters whose letters were returned as undeliverable were added to the challenge list. Following an evidentiary hearing, the District Court issued an Order barring the RNC from using the list to challenge voters and directing the RNC to instruct its agents in Ohio not to use the list for ballot security efforts. In Ohio 2004, “14 percent of new voters in majority-white voting precincts would face challengers while 97 percent of new voters in majority-black locations would face challengers,” wrote the Brennan Center. RNC staffers referred to the voter challenge list as a “goldmine” and also had plans to challenge Democratic-leaning voters in New Mexico, Florida, Nevada, and Pennsylvania if John Kerry had won. Forty-six states allow private citizens to challenge the eligibility of prospective voters, either on or before Election Day, and 24 allow private citizens to challenge a voter at the polls without offering any documentation to show that the voter is actually ineligible, according to the Brennan Center. The problem of voter intimidation is particularly worrisome in 2016 because after the Supreme Court gutted the Voting Rights Act, the Department of Justice “severely curtailed” the number of federal election observers who monitor voting discrimination at the polls. The only election rigging occurring in 2016 is the GOP’s attempt to suppress the vote. It likely won’t succeed, especially with recent court victories, but that doesn’t mean Trump and company won’t try.